Preheat your oven to 350 degrees. Line cupcake tins with cupcake liners. Place an Oreo cookie at the bottom of each liner. Mix cake mix, buttermilk, margarine and eggs according to the directions on the box. Bake for 19-22 minutes, or until a toothpick stuck in the middle comes out clean. Cool in the pan for 15 minutes, then transfer to a wire rack to cool completely. After the cupcakes are cool, top with Oreo Buttercream Frosting (below). Beat shortening, margarine and salt in a mixing bowl until blended, stopping to scrape down the side of the bowl. Add the syrup and beat at medium speed until smooth. Add half the sugar and mix well. Add the milk gradually, beating constantly at high speed for 5 minutes. Add remaining sugar and beat at low speed until blended. Increase speed to high and beat for 5 minutes. Scrape down the side of the bowl. Beat at high speed for 5 minutes longer. Fold in crushed cookies. Frost or pipe cooled cupcakes (I put mine in a large piping bag and used a Wilton #1A tip). 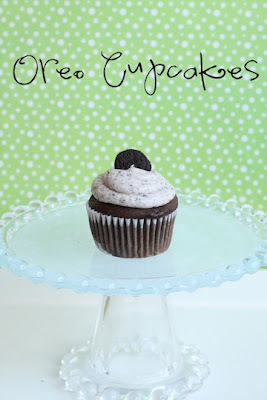 Top each cupcake with one mini Oreo cookie. My goodness these look yummy! I think the oreo on the bottom is the best part. Oh and I LOVE the cake plate! !